A Dimensional Robo perfect guard and stride fodder. AUTO [Choose one card from your hand, and discard it] When this is placed on (GC), you may pay the cost. If you do, choose a unit with “Dimensional Robo” in its name, and it cannot be hit until the end of the battle. 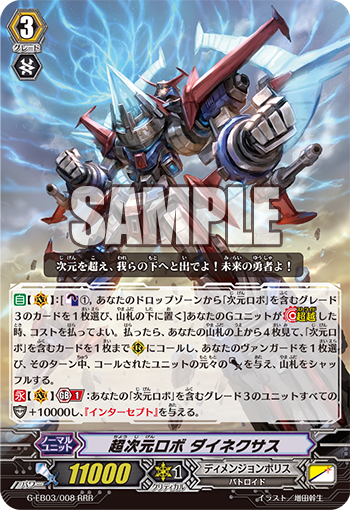 AUTO When this unit is placed on (GC), choose one of your vanguards with “Dimensional Robo” in its name, and it gets Power+4000 for each card in soul with “Dimensional Robo” in its name until the end of the battle. CONT While you would pay cost to Stride a G Unit with “Dimensional Robo” in its name, or when the cost of an ability of a card with “Dimensional Robo” in its original card name would choose a card in drop zone, this card may be regarded as a Grade 3. 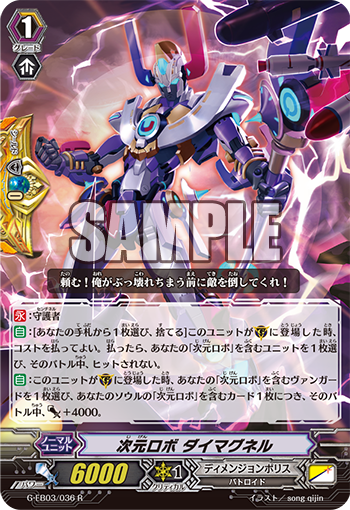 AUTO When this card is discarded from hand for the cost of Stride, choose one unit with “Dimensional Robo” in its name, it gets Power+4000 until the end of the turn, choose up to one card with “Dimensional Robo” in its card name from your drop zone, and place it into Soul.